The weather this winter has been frankly awful here in the Lake District. November and December consisted of one storm after another, each seemingly dropping more rain than the last on already saturated ground. The result was record high river levels across the county and the much publicised flooding which hit Keswick in early December and caused devastation in nearby Glenridding. Although matters improved slightly in January, everywhere was just so wet that getting out onto the fells wasn’t really a possibility. Fortunately, a few weeks later, river and lake levels are back to near normal and the land has started to recover. So when a clear day was forecast this week, for the first time since the autumn, we decided it was time to get the walking boots out. Due to various road closures caused by ongoing repairs to flood damage, getting around in the Lake District isn’t as easy as it should be at the moment (hopefully things will be back to normal very soon, though!). 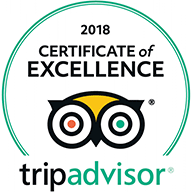 We therefore thought it sensible to stay fairly close to home and tackle a walk which might be of interest to our guests, and we eventually settled on climbing High Stile, a fell which can actually be seen from Keswick – if you stand in the right place! The start of the route is at Gatesgarth Farm, at the foot of the Honister Pass and very nearly on the shore line of Buttermere. 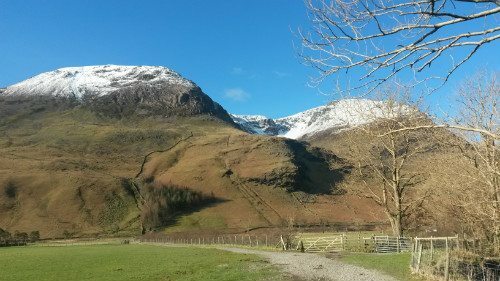 Around a 20 minute drive from Keswick along Borrowdale and over the Honister Pass, the farm provides ample parking for an all-day fee of £4. From here, the tops to be tackled loom overhead, but look surprisingly close at hand. A wide path crosses the valley floor behind the farm and rises across the hillside en route to Scarth Gap, the traditional crossing point between Buttermere and neighbouring valley Ennerdale. The first objective of our route, Seat, stands just to the north west of Scarth Gap at a modest 561m/1840ft. (Incidentally, this is also a good way to climb popular hill Haystacks, which lies on the opposite side of Scarth Gap). Whilst the climb to Scarth Gap is relatively gentle by Lakeland standards, it is the unfolding view of High Crag (744m/2441ft), the second of the day’s objectives, which is of most interest. A bulbous and fairly uninspiring looking hill from the valley floor, it suddenly takes on the appearance of a steep sided pyramid when viewed from the side. From the summit of Seat, following a short sharp climb from Scarth Gap, the route ahead looks positively daunting. 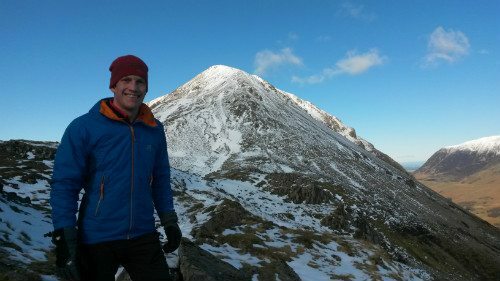 Matters weren’t helped for us by the fact that recent snow falls had left a thick blanket of snow clinging to the entire 250m or so climb to the top of High Crag. Very pretty to look at, not so easy to climb! 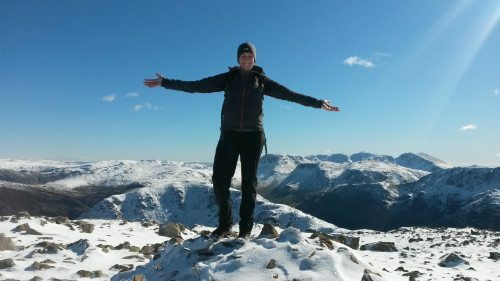 The effort, however, is worth it, because the views from the top are magnificent, particularly to the south east where the tops of the Scafell range stand in line dominating all other neighbouring peaks. Continuing on our route, the path drops down and continues across a high saddle of land connecting High Crag to the flat topped bulk of High Stile. At 807m/2648ft, High Stile is the highest point of the walk and a major peak in the Lakeland hierarchy. From here, the view opens out across the Solway Firth and into Scotland to the north and across the Irish Sea to the Isle of Man to the west. 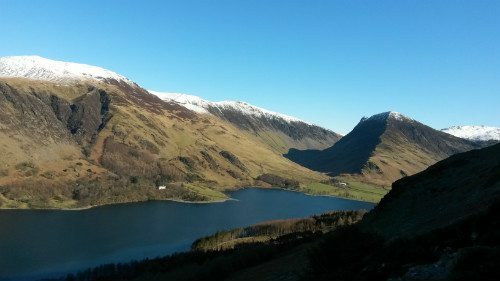 To the south, the Ennerdale fells present their most craggy and dramatic aspect, with Pillar (892m/2927ft) standing dominant. The wide, flat top of High Stile contains 2 competing summit cairns with, according to the OS map, only one meter difference in height between them. Whilst the first cairn reached is actually the higher, it is the second that provides the better viewpoint. From here, the path falls to another high saddle of land before rising gently to Red Pike (755m/2477ft), the final peak of the day and named, presumably, for the red rocks which adorn the summit area. 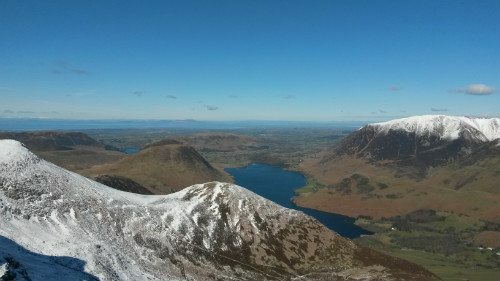 Like all of the peaks in this range, Red Pike faces north with almost vertical cliffs falling down to Buttermere and Crummock Water. In a deep hollow between Red Pike and High Stile nestles Bleaberry Tarn, its waters fed by the numerous cascades tumbling down the crags. Our route took us down the main path from summit to tarn. Normally, I would describe this path as one I would rather climb down than up, as it is particularly steep and unremitting, but in heavy snow it is probably best avoided altogether! Fortunately, we arrived at Bleaberry Tarn without incident. From here, the path follows Sour Milk Gill downhill from the tarn. Initially indistinct and boggy, the path soon becomes paved and falls clearly to the forest below, eventually arriving at the shoreline of Buttermere. All that follows is a pleasant walk back through the lakeside woodland to Gatesgarth Farm and the car. The total distance walked was around 7.5miles/12km, and took us around 5 hours, although we were slowed considerably by the heavy snow lying on the hill tops!